The synopsis doesn't do this book justice. It's rather confusing and makes my head spin when I try to read it more than once. Okay yeah, the book is pretty hard to explain without me rambling the summary in a giant paragraph. I'm comparing the political intrigue in this book with the one in my favorite series, The Winner's Curse series. The background for these interplanetary systems are very well set up from the start. The author does a fantastic job at explaining the whole issue with the blood bond and how in order to have a successful marriage alliance, you need the two heirs from each house. Political intrigue is always a fun concept to see in YA. It adds a complexity that you normally wouldn't see. You're also allowed to choose sides and kind of reason with the character's decisions. It's a lot of fun and whenever you see a book with political intrigue, I suggest you pick it up right away and recommend it to me as well! For those that don't enjoy a slow burning romance, just consider this: Slow burning romances are ALWAYS better than insta-love romances! Now that we've got that cleared up, we can talk about this incredibly slow burning romance that doesn't even develop fully at the end. You're going to be desperately gasping for the second book and since it's a duology, you can expect some steamy scenes in Book 2. Asa and Eagle begin hating each other in the beginning. They're both not happy that they're in an arranged marriage and that they're going to have to one day make babies with each other. But besides that fact, Asa has just pulled an extremely dangerous stunt with the marriage alliance and Eagle wasn't aware of it until it was too late. Imagine if the person you were arranged to marry isn't who you end up marrying. He, over time, learns that she had a reason for doing what she did and that she'll do whatever is takes to save her House and sister, Wren. Even from when this book was released, it did not receive as much hype as I thought it would get. When I originally saw this book on its Goodreads page, I was intrigued because of the space and sci-fi aspect. Why aren't people talking highly about this book? Well this question is affected by many factors. It could be that the author is not well-know or even the possibly that the publishers didn't have a huge campaign for the book near its publication date. The back of the book says this is supposed to be a duology but I wholeheartedly believe that the ending was superb and there's isn't more to be said. But I could be wrong. The author may have something else planned for the future installment, and I'll be sure to pick that up as well! I just want you all to know that this book didn't leave you off on a major cliffhanger or deserted island, so why wait to pick it up? 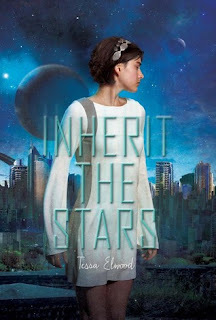 I didn’t enjoy Inherit the Stars enough to give it a five star rating, but I had a great time reading . Need I say more? An intergalactic thriller that has an interesting political concept and some pretty freaking awesome characters that won't disappoint! Make sure to be subscribed to my Youtube Channel because I'm going to post a 'space books' recommendation video soon! I actually featured this in one of my upcoming videos: Space Book Recommendations! I definitely recommend if you're into politics in space because it's a whole new world up there! Wow, this sounds like so much more than what the synopsis makes it out to be... I wasn't planning to pick it up, but after reading your review, it sounds like something worth looking into! I do hope so! I really do hate the synopsis haha. It's missing so much out of the book that I really loved!